Studio J, Port Townsend | Commercial photography, videography, writing, editing: a picture, a thousand words or both! Over the past 25+ years as a photographer, writer and editor, I’ve amassed more photos and stories than I could ever have imagined. Each week I’ll share some of the more interesting with you, so please come often to visit. 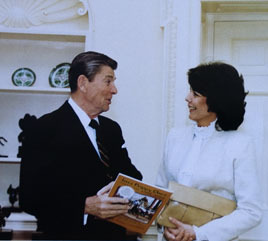 President Ronald Reagan was an avid horseman and as editor of a national equine magazine at the time, I had the wonderful good fortune of interviewing him in Washington, DC, for the Pacific Coast Journal. Over the years, I’ve met many celebrities, but none had the charisma of President Reagan. When he walked out from behind his desk to greet me, it was as if the rest of the world disappeared and there was nobody in the universe but him. His electric blue eyes bore into mine with such intensity that I couldn’t look away; even so, I felt completely at ease and at peace. I’ve not had that feeling about a person before or since. After the interview, as I was escorted by secret service toward a really cool door that seemed hidden in the wall, I noticed that the room had an odd shape. It was oval~as in the Oval Office. If I’d known earlier, I would have paid more attention!